Jenny and Rick are a married team making candles in their kitchen. Jenny is a graphic designer and animator for The Daily Show, and Rick’s an senior art director at an advertising agency. 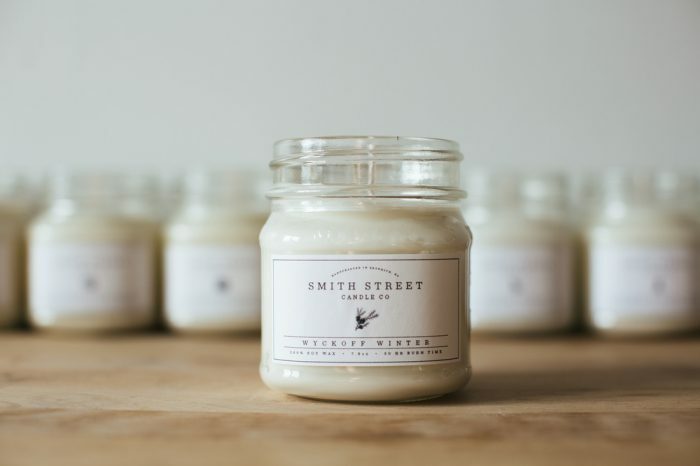 They started making candles as a way to do something with their hands after a long day of staring at computer screens. We started dating in winter in Chicago, and for our first date we went ice skating at night. It was mostly empty except for one skater dressed in a full-on Santa costume, beard and all. We still have that picture somewhere. It’s the perfect combination of wintry scents and warm light illuminating our tiny apartments. Perfect for those of us who long to have a fireplace. Where can we shop you in-person? Our line is carried exclusively at Woods Grove on Court Street in Cobble Hill.